These days, it is fairly easy to share things with other devices through cloud storage. However, those services are usually limited in size. Plus, it takes a few steps to grab a file, save it to a cloud storage app, then go to another device, open the cloud storage app, find the file, and download it. This app is designed to be easy to use. There are very few features. There are four sections in the iOS app that either act as the transport for a file (Send Clipboard and Send Photo) or give you instructions on how to activate file sharing (Send Websites and Send Documents). 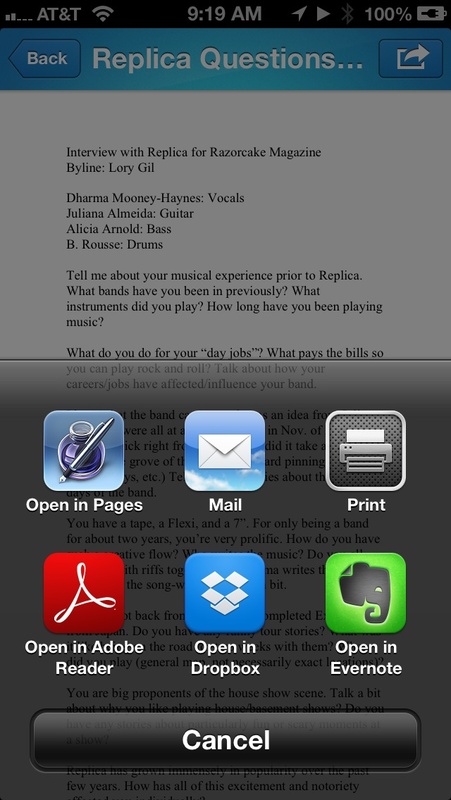 When a file is sent to your iPhone, it will appear as an icon for the type of file that it is. For example, Word documents will have the Microsoft “W” icon and MP3s will have the Quicktime “Q” icon. 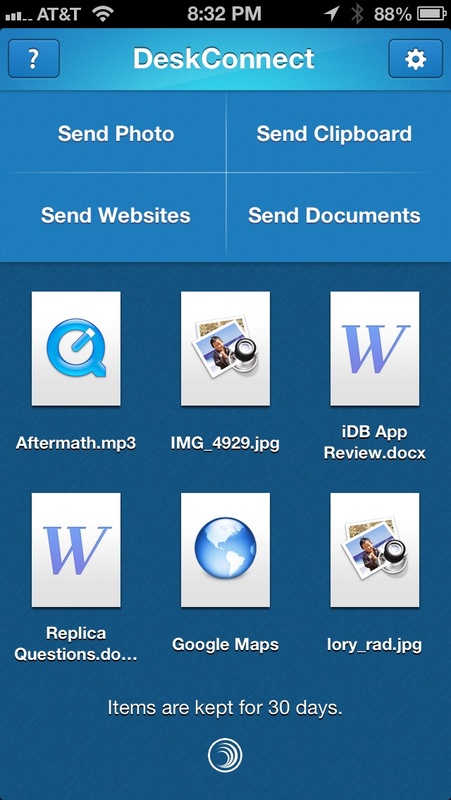 You can also send files from your iPhone to another device. You just have to have the app downloaded to the device. DeskConnect is also available for OS X for free. There is no optimized version for the iPad, but this is not the kind of app that needs to look good on the larger screen. The goal is to get files onto your iPad and into a compatible app. When you first open the app, you will be asked to give permission to send notifications. This feature is required to use DeskConnect on your iPhone, so select “Yes” or you won’t be able to receive files. You will then be asked to sign up or log in. You need a DeskConnect account in order to allow the files to be transferred between devices. After signing up for an account, you will see a short tutorial on how to share files. You will be able to send an email link to your desktop or laptop computer so that you can add those devices, as well. The link is to the Mac OS X App Store where you can download the app. Once downloaded, go to your computer’s Launchpad and double-click the DeskConnect icon. The app will automatically be added to your status bar. You can then drag and drop files to the app, copy text to the clipboard, or automatically send web links. Add as many devices as you like. There is not limit. I have my desktop, laptop, iPhone and iPad all connected and can share files between all devices. Adding files is ridiculously simple. I found that sharing things from my desktop or laptop were actually a lot easier than sharing them from my iOS device. There is no drag-and-drop feature on the iPhone, so you have to manually share them by using a share icon when available. For example, I could easily drop a song into the DeskConnect app from my laptop and share it to my iPhone, but I was never able to figure out how to send a song from my iPhone at all. It’s likely a feature that has been restricted due to copyright concerns. You can share all manner of files, as long as they are smaller than 100MB. I was able to send myself Word files, JPEGs, GIFs, MP3s, ALAs, YouTube videos, Vimeo clips, and Google Maps directions. It is important to note that I was never able to properly open the Google Maps directions on my iPhone 5. Even after I switched the default map to Google, the app crashed every single time I tried to open the link. I even deleted and reinstalled DeskConnect to see if that would help. Sharing website links is simple on OS X. All you have to do is have the browser window selected when you open Deskconnect. The link will automatically be ready to share with one of your other devices. When you click on the link in the app in another device, it will automatically open in Safari, YouTube, Vimeo, or whatever compatible app the link is related to. When sharing from an iPhone to a Mac, there are a few more steps to set up the Bookmark feature, but after it has been done once, you won’t have to do it again. The app includes detailed instructions on how to set up the website sharing Bookmark on your iPhone. 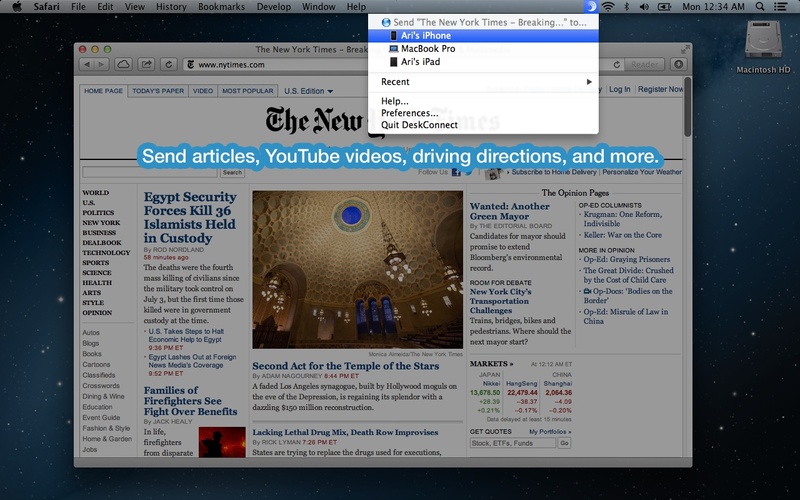 You can also copy anything, including links, emails, and documents, and then share them through the Clipboard feature. Anything that you “Copy” on your iOS device or OS X device will automatically be shared when you select “Send to Clipboard” from DeskConnect. All of the files are stored temporarily on the device it is sent to. Temporary files are only stored for 30 days. In the iOS app, you can save a file to a different app by selecting the file and then tapping the Share icon in the upper right corner. Then, pick the app you want to send it to. For example, you could save a Word file in Pages, Adobe Reader, GoodReader, Evernote, Dropbox, or another compatible app. Then, save it in the new app. On your Mac, you can save the temporary files in a similar fashion. There will be a Share icon in the upper right corner when you open the item in the DeskConnect File Viewer. By having DeskConnect on all of your devices, you can access many documents and files without any more effort than dragging and dropping, copying and pasting, or selecting and sending. I regularly switch between my desktop and laptop. Sometimes, when I am in the middle of writing a review, I want to switch computers, but the effort of saving it to Dropbox and then opening it on another device is too many steps to make it worth my time. This app makes it possible to send files without having to save, add, or open any app. Being able to send website links to my iPhone is very useful. I use a desktop computer most of the day, but if I want to show something to a friend later on, when I’m not at home, I can quickly send the link to my iPhone and call it up instantly when I open the app. I was very disappointed that I couldn’t get the Google Maps link to work on my iPhone. I think this is a very useful feature and could potentially make sharing directions much easier. I noticed that the app would lag significantly when I tried to listen to music that I sent to myself. Additionally, Even ALA files are not savable in iTunes. There is probably a reason for this, but I wish I could send myself songs that I can play in iTunes. DeskConnect for iOS and OS X are both free to download. The value of these productivity applications is through the roof. Even if you have multiple ways to share files through a cloud storage service, this app is invaluable for quick access to documents without having to save them somewhere else first. I didn’t even know how much I needed DeskConnect until I tested it out. Now, I don’t think I’ll ever get rid of it. It is easy to use and lets you share files with multiple devices with the simplest of actions. There are no storage capacity limits and you can send practically any type of file, as long as it is less than 100MB. 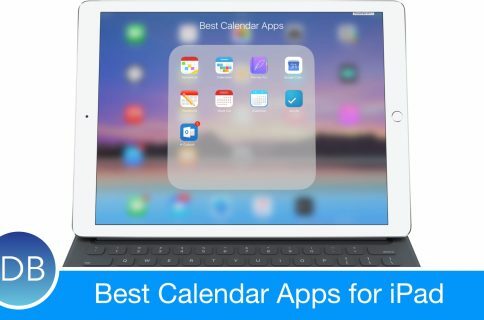 If you regularly switch between desktop, laptop, and iOS devices in your daily activities, these apps will make your work quite a bit easier. Download DeskConnect for iOS and OS X for free today. When it comes to sharing files, Dropbox offers a similar service, but has storage limitations. LogMeIn gives you access to your computer without requiring you to save documents in a cloud-based storage. What is your favorite file-sharing app?